The Ole Miss Rebels football program represents the University of Mississippi, also known as "Ole Miss". The Rebels compete in the Football Bowl Subdivision (FBS) of the National Collegiate Athletic Association (NCAA) and the Western Division of the Southeastern Conference (SEC). The football history of Ole Miss includes the formation of the first football team in the state and the 26th team on the list of college football's all-time winning programs. The Ole Miss Rebels posted their 600th win on September 27, 2008 when they defeated the (then-ranked No. 4 and future 2008 Bowl Championship Series (BCS) national champion) Florida Gators 31–30 at Ben Hill Griffin Stadium in Gainesville, Florida. Throughout the 115-year history of Ole Miss football, the Rebels have won six Southeastern Conference titles (1947, 1954, 1955,1959,1960,1962,1963,1964) and six national titles (1955,1959,1960,1962,1963,1964). The team is currently coached by Hugh Freeze. In 1890, Dr. A.L. Bondurant, later the dean of the Ole Miss Graduate School, rallied Ole Miss students to help form an athletic department to encompass the sports of football, baseball and tennis. The students brought this initiative to reality and in 1893, with Bondurant as the coach, a football team came to fruition. The first team won four of five games during that inaugural football season. One of those wins was the very first football game ever played by an Ole Miss team, a 56–0 defeat against Southwest Baptist University of Jackson, Tennessee (now known as Union University). This was on November 11, 1893. The next year, 1894, Bondurant passed on his coaching duties. Ole Miss Football, a book published in 1980 by Sports Yearbook Company of Oxford, MS, says J.W.S. Rhea was the first coach at Ole Miss having been hired part-time by Bondurant and having led the 1894 team to a 6–1 record. The annual Ole Miss media guide lists C.D. Clark as the coach of the 1894 team and further says about him, "Although it has never been documented, it is thought that C.D. Clark of Tufts was the first paid football coach at Ole Miss. His name appears as manager of the team as shown in the Ole Miss Magazine dated November 1894." The College Football Data Warehouse also lists Clark as the coach for the 1894 team. Twice in its history, Ole Miss did not field a football team. In 1897, a yellow fever epidemic cancelled the football season. In 1943, football was abolished at all Mississippi state-supported institutions by the state college Board of Trustees due to World War II. Nathan Stauffer served as the head coachfor the 1909, 1910 and 1911 seasons. His record at Ole Miss was 17 wins, 7 losses and 2 ties (17–7–2). In February 1925, Homer Hazel signed to become the head football coach at Ole Miss. Hazel coached the team for five years, compiling records of 5–5 in 1925, 5–4 in 1926, 5–3–1 in 1927, 5–4 in 1928, and 1–6–2 in 1929. His five-year record as head football coach was 21–22–3. After the poor showing in 1929, the Ole Miss student body and alumni were reportedly opposed to Hazel's tactics on the football field. Hazel resigned his post at Ole Miss in January 1930. Thad Vann, who played for Hazel at Ole Miss from 1926 to 1929, later credited Hazel with "launching the University of Mississippi's rise as a national football power". Leading Ole Miss into the Southeastern Conference in 1933 was head coach Ed Walker, who served as the Rebels' head coach from 1930 to 1937. The Rebels compiled a record of 38–38–8 record under Walker, which included a 9–3 campaign in 1935, which culminated in a loss in the Orange Bowl. Under head coach Harry Mehre, who led the Rebels from 1938 to 1945, the Rebels compiled a record of 39–26–1, which included two 9–2 seasons in 1938 and 1940. In his first season at the helm in 1947, the Rebels posted a 9–2 record and won the first of six SEC crowns (1947, 1954, 1955, 1960, 1962, 1963). That 1947 season also saw Ole Miss great Charlie Conerly become the first Rebel player to be a contender for the Heisman Trophy, placing fourth in the voting for the prestigious honor. Ole Miss won the 1959 Dunkel System national crown, the 1960 Football Writers Association of America, Dunkel System, and Williamson System national championships and the 1962 Litkenhous Ratings national title. Vaught's 1962 squad remains the only undefeated team in Ole Miss football history. Vaught's 1959 squad, which was honored as the "SEC Team of the Decade," was ranked the third best collegiate football team from 1956 to 1995, according to the Jeff Sagarin Ratings released in January 1996. The Rebels were also among the winningest programs in the country under Vaught during the 1950s and 1960s. From 1950 to 1959, Ole Miss posted an 80–21–5 record (.778 winning percentage). The 77.8 winning percentage was third to only Oklahoma and Miami (OH) during that decade. 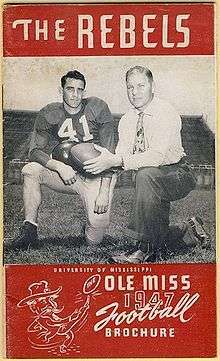 In the 1960s, Vaught guided the Rebels to a 77–25–6 record and a 74.0 winning percentage, which was the ninth best during that decade. The Rebels 1962 season under Vaught is, to this day, the only undefeated season in Ole Miss history. The Rebels ended that season 10–0 and as national champions. During his time at the helm, Vaught coached some of the best players ever to wear the Red & Blue. In 24 seasons, Vaught produced 26 All-America first teamers. He also coached four players who finished in the top five in the Heisman Trophy voting. Along with Conerly in 1947, Charlie Flowers (5th in 1959), Jake Gibbs (3rd in 1960) and Archie Manning (4th in 1969, 3rd in 1970) were in the running for college football's top honor. Failing health forced Vaught to resign his position in 1970 and the reins of the Ole Miss football program were turned over to Billy Kinard. Vaught is the only coach in Ole Miss history to win an SEC football championship. His 1960 team finished 10-0-1 and was the only major-conference team to go undefeated on the field that year. As a result, it won a share of the national championship; it was awarded the Grantland Rice Award from the Football Writers Association of America after the bowl games. In those days, the wire services crowned their national champion before the bowl games. It is very likely that Ole Miss would have finished atop one poll, if not both, had they been taken after the bowl games as they are today. Vaught took Ole Miss to 18 bowl games, winning 10 times including five victories in the Sugar Bowl. Only two coaches held a winning record against Vaught: Paul "Bear" Bryant, with a record of 7 wins, 6 losses, and 1 tie against Vaught, and Robert Neyland holding a 3 win to two loss advantage. Billy Kinard became the first Ole Miss alumnus to head up the football program after Vaught's resignation. The Rebels went 16–9 under Kinard, including a 10–2 record and a 41–18 Peach Bowl victory over Georgia Tech in his first year in 1971. Kinard's 10 victories are tied for fourth most by a first-year head coach in NCAA Division I history. Kinard coached the Rebels through the 1972 season and through the third game of the 1973 season. After the disappointing 5–5 season in 1972, there was some pressure among the alumni to have Kinard removed. 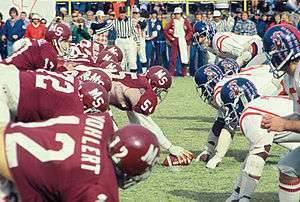 The administration bowed to this pressure after the Rebels started the 1973 season 1–2, including a shutout loss to Missouri, 17–0, and was upset by Memphis State, 17–13. Both Billy Kinard and Frank Kinard were fired, and Johnny Vaught was rehired as both the head coach and athletic director. Ken Cooper, an assistant under Kinard since 1971, was named head coach on Jan. 17, 1974, and took Ole Miss through the 1977 season. Cooper compiled a 21–23 record during his four years at the helm, and his tenure is probably best remembered for one hot and humid day in September 1977. In one of the most memorable games in Rebel football history, Ole Miss upset Notre Dame, 20–13 in Mississippi Memorial Stadium on Sept. 17, 1977, in Jackson. That loss was the Irish's lone setback of the 1977 campaign, as Notre Dame finished the season with an 11–1 record and claimed both the AP and UPI national titles. Cooper is now the assistant head coach and offensive line coach at Benedictine Military School in Savannah, Ga. Following the 1977 season, Steve Sloan, the former All-American quarterback at Alabama under Paul "Bear" Bryant, was hired as the new Rebel boss and began his five-year stint in 1978. Sloan posted a 20–34 record from 1978 to 1982. In December 1982, Sloan decided to leave Ole Miss to become the head football coach at Duke. In his first season, Brewer guided the Rebels to their first winning regular season since 1977 with a 7-4 mark (they were subsequently awarded a win over Tulane by forfeit a year later). The Rebels also received their first bowl game invitation since 1971 and met Air Force in the Independence Bowl played in Shreveport, Louisiana. Ole Miss dropped a 9-3 decision to the Falcons and finished with a 7-5 record. During his 11-year tenure, Brewer led the Rebels to six winning seasons and five bowls, including Ole Miss' 1991 New Year's Day Gator Bowl appearance. The Jan. 1 bowl game was the program's first since 1969. He was named SEC Coach of the Year in 1986 (8-3-1 record), which saw the Rebels return to the national rankings for the first time in over a decade and tie for second in the SEC--their highest finish in 11 years. They just missed out on an SEC championship due to a 22-10 loss to the University of Tennessee the second to last game of the season. The next year, the Rebels returned nine starters on both sides of the ball. However, they flopped to a 3-8 record, a severely disappointing mark even considering that they were hobbled by NCAA sanctions for recruiting violations. They were outscored 127-47 in the season's final three games. Following a 35-6 loss to a mediocre Kentucky team that put that year's team at 1-5, an anonymous group of students under the name Students Against Billy Brewer even took out an ad in the university student newspaper calling for Brewer's firing. The 1988 team, with little expected by most people, defeated Alabama in Tuscaloosa on their homecoming for the first time in history, came from behind to win two more games and looked to be in excellent position to secure a winning season and bowl berth. But the Rebels fell to Tulane in a devastating 14-9 upset on homecoming and also suffered a very heartbreaking loss to a 5-6 Tennessee team at home before rallying to trounce Mississippi State 33-6 in a severe thunderstorm in Jackson. Ole Miss would go 8-4 in 1989, and in the aforementioned 1990 season would notch nine wins and again narrowly miss an SEC title due to a loss to Tennessee. They also made their first appearance in a final media poll since 1971. However, none of the nine wins came against a team with a winning record. Brewer garnered SEC Coach of the Year honors that season. In 1992, Ole Miss posted yet another nine-win season and finished with a national top 15 ranking. But the next year and what turned out to be Brewer's last, Ole Miss would become the first team ever in college football to finish with a losing record (a forfeit from Alabama years later gave the team an in-the-books winning season) despite having the nation's number one team in total defense. In his 11 seasons, Brewer led Ole Miss to eight Egg Bowl victories over in-state rival Mississippi State. At Ole Miss, Brewer compiled a 67-56-3 record, placing him second on Ole Miss' all-time wins list behind Vaught. However, Brewer's tenure at Ole Miss was marred by allegations of recruiting improprieties that twice led to run-ins with the NCAA. The Rebels were banned from post-season play and live television for the 1987 season after a two-year investigation found that Ole Miss recruits had received cash and other gifts from boosters. The penalties were a source of embarrassment for Dr. Gerald Turner, then Ole Miss' chancellor and previously the head of the NCAA's President's Commission, and one of the first milestones in Turner's stormy relationship with Brewer. "We have made some mistakes," Brewer said at a news conference following the announcement of the sanctions. "We are being punished for those mistakes, and we do not intend ever to be in this situation again." However, in December 1993, Brewer and Ole Miss were again hit by allegations of recruiting violations. The NCAA would eventually cite the program for 15 transgressions, all of them serious and some of them embarrassingly lurid. An NCAA report said that Ole Miss boosters and coaches had offered recruits gifts, including cash and, in one case, a car. Boosters were also accused of breaking national rules by taking recruits 30 miles outside of Oxford, sometimes to strip clubs in Memphis. Most damningly, the NCAA alleged that Ole Miss officials knowingly allowed the violations to occur, demonstrating a lack of institutional control of the football program. The charges forced Athletic Director Warner Alford to resign in July 1994. One day later, Turner fired Brewer, granting him 30 days' paid leave but no other severance package for the three years remaining on his contract. Later that year, the NCAA, when announcing severe penalties against the Ole Miss football program, found Brewer guilty of unethical conduct. Specifically, it stated "There was unethical conduct by a former (Ole Miss) head football coach (Brewer), who was found to show a continuing pattern of disregard for NCAA rules in the operation of the football program ((Jackson, MS) Clarion Ledger, November 18, 1994, p.6-7C)." Brewer sued the University for his dismissal, eventually receiving several hundred thousand dollars. On Dec. 2, 1994, Texas A&M defensive coordinator Tommy Tuberville was selected as the next Rebels head coach. Despite no prior head coaching experience, Tuberville began creating excitement in his first season in 1995, finishing the campaign with a 6–5 record and an Egg Bowl victory over Mississippi State. 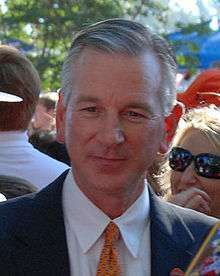 Tuberville was named the SEC Coach of the Year in 1997 by the AP. During his tenure, he acquired the nickname "The Riverboat Gambler" for his aggressive play calling, particularly on fourth down. While at Ole Miss, Tuberville made the statement, "They’ll have to carry me out of here in a pine box," in reference to not leaving to coach at another school. Two days after he made that statement, it was announced that he was departing for Auburn. Tennessee offensive coordinator David Cutcliffe took over as the Rebels head coach on Dec. 2, 1998. Cutcliffe brought with him to Oxford a high-powered offensive style that had been successful at Tennessee and energized the Rebel fanbase. The most notable player during the Cutcliffe era was undoubtedly quarterback Eli Manning, son of Rebels legend Archie Manning. During his years with Ole Miss, Manning set or tied 45 single-game, season, and career records. His career numbers include 10,119 passing yards (fifth on the SEC career list), 81 touchdown passes (third on the SEC career list), and a passer rating of 137.7 (tied for sixth on the SEC career list). He led the Rebels to a 10-3 record and a 31-28 SBC Cotton Bowl Classic victory over Oklahoma State in 2003 and then was selected with the top overall pick in the 2004 NFL Draft. As his senior year came to a close, Manning won many awards including the Maxwell Award as the nation's best all-around player, the Johnny Unitas Golden Arm Award, the National Football Foundation and College Football Hall of Fame Scholar-Athlete Award, the Sporting News Radio Socrates Award, and the SEC Most Valuable Player Award. He was also a candidate for the Heisman Trophy, finishing third in the final voting. Entering the 2005 season, Orgeron had hoped to bring a USC-style offense to the Southeastern Conference (SEC), but found limited success. The University of Mississippi's offense finished the season ranked 111th out of 117 Division I-A schools, in total offense; 115th in scoring; and, 116th in rushing. Though Orgeron's defensive experience, along with returning linebacker Patrick Willis, helped the Rebel defense in 2005, the offense always seemed to produce more interceptions than touchdowns. As a result, the 2005 team struggled and finished the season with a record of three wins and eight losses—the Rebels' worst record since 1987. In 2007, Ole Miss finished the season 0–8 against fellow SEC teams, and 3–9 overall. It was the program's first winless (conference) season since 1982. On November 24, 2007, after Ole Miss blew a 14-point fourth-quarter lead to in-state rival Mississippi State in the season finale, Orgeron was fired. Next on the schedule was Alabama, ranked No. 2 in the nation at the time. During the game, Ole Miss became the first team Alabama trailed in the 2008 season. Alabama ultimately prevailed, however, in the final series of the game, winning, 24–20. Then came Arkansas. Nutt, facing his old team, came out victorious, 23–21. The Rebels followed that with a 17–7 home win against Auburn. On November 15, Ole Miss beat ULM, 59–0, to push their record to 6–4 and become bowl eligible for the first time since 2003. Ole Miss next beat No. 8 LSU, 31–13, in Baton Rouge, snapping a six-game losing streak to the Tigers, earning the Rebels an Associated Press ranking of No. 25, the first time in four years Ole Miss had been ranked, and putting them in position for a possible bid to the Cotton Bowl Classic in Dallas, Texas. The Rebels went on to beat SEC West and in-state rival Mississippi State, 45–0, in the Egg Bowl to finish the regular season at 8–4. The win over the Bulldogs moved the Rebels up to No. 22 in the AP Poll and landed the team their first ranking of the year in the Coaches' Poll, coming in at No. 25. Ole Miss defeated No. 7 Texas Tech, 47–34, in the Cotton Bowl Classic. The Ole Miss Rebels began the 2009 season ranked high and with high expectations. After beating Memphis, 45–14, and Southeastern Louisiana, 52–6, which gave Ole Miss the second longest winning streak in the nation at eight games dating back to the 2008 season, Ole Miss climbed as high as No. 4 in the AP Poll before losing their 2009 SEC opener, 16–10, on the road at South Carolina in a Thursday night game on September 24. After the loss, Ole Miss fell 17 spots in the AP Poll, down to No. 21. Ole Miss went on the road again and beat Vanderbilt the next week, 23–7. After a disappointing start and pair of conference losses, they managed to rebound against Arkansas, winning 30–17. Ole Miss went on to beat No. 8 LSU, 25–23, at Oxford. Ole Miss lost to in-state and SEC rival Mississippi State on November 28 in the Egg Bowl at Starkville, 41–27. Ole Miss was picked to play in the Cotton Bowl Classic for the second year in a row, where they defeated Oklahoma State, 21–7, to end the season. Nutt's Rebels finished 4–8 overall in the 2010 season, including 1–7 in the SEC. Among the worst of these losses was to FCS-member Jacksonville State, which was Ole Miss' first loss to a lower division team since 1945. Adding insult to injury, Nutt suffered his first loss to his former team, as Arkansas defeated Ole Miss 38–24. The crowd at Razorback Stadium in Fayetteville mockingly chanted Nutt's name after the game was over. It was announced on April 16, 2009 that Nutt and his wife Diana had committed to give a gift of $100,000 to Ole Miss. Half of the contribution will create scholarships for student-athletes. The other half of the gift will be used toward the university’s Indoor Practice Facility, which opened in 2004 and cost $17 million to build. Nutt was fired as head coach after a dismal 2011 season, ending a disappointing tenure that had begun with much optimism. 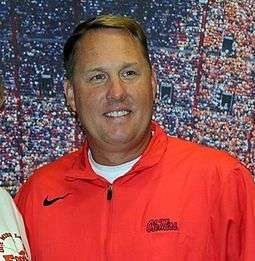 On December 5, 2011, Hugh Freeze was announced as the 37th head coach of the Ole Miss Rebels football team. An Oxford native, Freeze was previously the head coach at Arkansas State for one season and had previously been the tight ends coach and recruiting coordinator under Houston Nutt from 2005–2007 and had even interviewed with Nutt for the Rebels offensive coordinator job. In 2012 Ole Miss went 7–6 and finished the regular season with a win over rival Mississippi State. The Rebels won their bowl game against Pitt in the BBVA Compass Bowl. In Freeze's second year, the Rebels went 8–5 (3–5 in the SEC). The 2013 Rebels defeated then-sixth-ranked LSU on a last-second field goal in Oxford and capped off the season with a 25–17 victory over Georgia Tech in the Music City Bowl. In 2014, Freeze led Ole Miss to one of its strongest seasons in four decades. The Rebels spent most of the season in the top 10, rising as high as third in October—their highest ranking at that late stage in the season in almost half a century. They defeated Alabama at home that October and ultimately finished 9–3, only the third time since Vaught's tenure that a Rebel team has won as many as nine games. This garnered them a berth in the 2014 Peach Bowl against TCU—their first major-bowl appearance since 1969. However, TCU crushed the Rebels by a score of 42-3. Freeze led to the Rebels to another strong season in 2015, one that featured wins over ranked rivals LSU and Mississippi State, but was headlined by a road victory over then-no.2 Alabama, their first win in Tuscaloosa since 1988 and only the first time they had beaten the Tide in back to back seasons. Ole Miss controlled their own destiny in the SEC West for much of the 2015 campaign, but ultimately finished in second. The Rebels earned a trip to the 2016 Sugar Bowl, their first appearance in this bowl game since 1970, where they beat Oklahoma State 48–20. While the NCAA's website states that "the NCAA does not conduct a national championship in Division I-A football and is not involved in the selection process," it goes on to say that "a number of polling organizations provide a final ranking of Division I-A football teams at the end of each season." Ole Miss claims three national championships based on other polls, however only one is recognized by the NCAA (1960 shared with Minnesota). The other two were retroactive selections, meaning Ole Miss gave itself these national championships. The major wire service polls of the time (Associated Press & United Press), named Syracuse the National Champion in 1959, Minnesota in 1960, and USC in 1962. Those polls were taken before the bowl games; had the 1960 poll been taken after the bowl games (as is the case today), Ole Miss would have likely won it since it was the only major-conference team in the nation to go undefeated on the field. In 1955, the Rebels were declared National Champions by the Massey Ratings, though they are not considered to be a major poll and it is not claimed by the University. Most points ever scored in a game by Ole Miss came in a 114-0 win over Union College on October 29, 1904. Ole Miss became the nation's first college football team to fly to a game in 1937. The team flew from Memphis to Philadelphia to play Temple University Temple Owls. Ole Miss plays a central role in Michael Lewis's book The Blind Side: Evolution of a Game and its 2009 film adaptation, The Blind Side. 1952: Maryland- The 11th-ranked Rebels splashed onto the national scene by defeating the 3rd-ranked Maryland Terrapins in Oxford on Nov. 15, 1952 by the score of 21–14. This game is credited by many for being the catalyst to the great run the Rebels had from 1952 to 1963. 1960: LSU- On Jan 1, 1960, one of the most anticipated rematches in college football history took place, but No. 2-ranked Ole Miss dominated No. 1-ranked LSU from start to finish and came away with a decisive 21–0 win over the Tigers. The Rebels finished the season having only given up 21 points all year, declared national champions by several polls, and named the third-rated team in history (through 1995) by the Sagarin ratings, behind only two great Nebraska teams. 1986: LSU- Billy Brewer’s 5-2-1 Rebels entered Tiger Stadium, where they had not won since 1968, to face 12-ranked LSU. Ole Miss sophomore QB Mark Young and the Rebels built a 21-9 halftime lead. LSU stormed back in the second. With 12:09 remaining, LSU’s David Browndyke booted a 21-yard FG that trimmed the lead to 21-19. Later, LSU QB Tommy Hodson led the Tigers from the LSU 34 to the Rebel 13. But with only 0:09 to play, Browndyke’s potential game-winning 30-yard FG sailed wide left and ignited a wild celebration among Rebel fans jammed into southeast corner of Tiger Stadium. 1997: LSU- After a harsh two-season bowl ban, Tommy Tuberville’s 1997 Rebels squad arrived in Baton Rouge with a 3-2 record and in search of a signature win. Meanwhile, the 5-1 and No. 8-ranked Tigers entered fresh off of an upset of then No. 1-ranked Florida. After trailing 21-14 at the half, the Rebels dominated the second half, outscoring the Tigers 22-0 in route to a 36-21 win. Ole Miss QB Stewart Patridge threw for a career-high 346 yards with two touchdowns. John Avery rushed for 137 yards and two scores. Their combined efforts accounted for all but five of the Rebels’ 488 yards of total offense. The celebrated win at Tiger Stadium was the first for Ole Miss over a top 10 opponent since 1977. Ole Miss fished the season with a record of 8-4 (4-4 SEC) that included a Motor City Bowl win over Marshall. The Rebels went 16–9 under Billy Kinard, including a 10–2 record and a 41–18 Peach Bowl victory over Georgia Tech in his first year in 1971. Kinard's 10 victories are tied for fourth most by a first-year head coach in NCAA Division I history. Following the 1977 season, Steve Sloan, the former All-American quarterback at Alabama under Paul "Bear" Bryant, was hired as the new Rebel boss and began his five-year stint in 1978. Sloan posted a 20–34 record from 1978 to 1982. On Dec. 2, 1994, Tommy Tuberville was selected as the coach in charge of getting the Rebels on the right track. David Cutcliffe took over as head coach on Dec. 2, 1998. Cutcliffe, who came to Ole Miss from his offensive coordinator post at Tennessee, took over the reins just 29 days before the Rebels' Sanford Independence Bowl date versus Texas Tech. Despite the short preparation time for the game, Cutcliffe led the Rebels to a 35–18 victory over the Red Raiders, quite arguably the biggest upset of the 1998 bowl season. On November 7, 2011 it was announced that Coach Nutt would resign from the position of head coach at Ole Miss. His resignation became official once the season came to a close as he finished his final 3 games at the university. In 2014, Freeze led Ole Miss to one of its strongest seasons in four decades. The Rebels spent most of the season in the top 10, rising as high as third in October—their highest ranking at that late stage in the season in almost half a century. They ultimately finished 9–3, only the third time since Vaught's tenure that a Rebel team has won as many as nine games. This garnered them a berth in the 2014 Peach Bowl—their first major-bowl appearance since 1969. Freeze led to the Rebels to another strong season in 2015, one that featured wins over ranked SEC West Rivals LSU and Mississippi State, but was headlined by a road victory over then-no.2 Alabama, their first win in Tuscaloosa since 1988 and only the first time they had beaten the Tide in back to back seasons. Ole Miss controlled their own destiny in the SEC West for much of the 2015 campaign, but ultimately finished in second. The Rebels earned a trip to the 2016 Sugar Bowl, their first appearance in this bowl game since 1970, where they beat Oklahoma State 48–20. Freeze led the Rebels to their first 10 win season since 2003, and perhaps their best season overall since they went 10-0 in 1962 during the Vaught era. The 2007 season was a historic one for Ole Miss. The Rebels went winless in the SEC for the first time since 1982 – 25 years. The Rebels, under head coach Ed Orgeron, ended the season at 3–9 (0–8 in SEC play). The 2007 season culminated with defeats to LSU (27–41) and Mississippi State (14–17) which resulted in the firing of Orgeron the following day. Three days later, Houston Nutt was hired as the next head football coach. With new coach Houston Nutt at the helm, Ole Miss showed significant improvement in their team throughout the 2008 season. The Rebels began the season with a 41–24 victory over Memphis before losing a thriller on the road against #20 Wake Forest. After soundly beating Samford at home, Ole Miss lost its SEC opener against Vanderbilt, 23–17. The Rebels entered the game against #4 Florida as overwhelming underdogs, but managed to pull off a monumental upset in Gainesville by beating the Gators, 31–30. Ole Miss would lose its next two games against South Carolina by a score of 31–24 and against #2 Alabama by a score of 24–20. However, the loss against Alabama would be Ole Miss's last of the season, as they would win their last five games, which included wins against Arkansas, Auburn, Louisiana-Monroe, and a road upset against #18 LSU. Ole Miss entered the final game of the regular season ranked #25, which was the first time Ole Miss was ranked in the Top 25 since 2003. Ole Miss dominated Mississippi State in the final game of the regular season, beating the Bulldogs by a score of 45–0. Ole Miss finished the regular season with a #20 ranking and an invitation to the Cotton Bowl, where they beat Texas Tech by a score of 47–34. The Rebels finished the season ranked #14. The 2009 season was one of ups and downs for the Rebels, as the team entered the year with some of the highest expectations of any Ole Miss team in almost half a century. Ultimately, the Rebels failed to meet those lofty expectations. The Rebels finished with an 8–4 (4–4 SEC) record and an invitation to the Cotton Bowl Classic, a respectable showing but far short of the results that the team, its fans and the national media had anticipated before the season. The Rebels began the 2009 season ranked No. 8 by the Associated Press Poll and No. 10 by the USA Today Coaches Poll. Ole Miss started the season with wins over Memphis and Southeastern Louisiana, and after some key early-season losses by other top-10 schools, the AP poll put the Rebels at No. 4 in week 3—the team's highest ranking since 1970. On a Thursday night, September 24, the Rebels were defeated by an unranked University of South Carolina Gamecocks squad in Columbia, S.C., by a score of 16–10, before a nationally televised ESPN audience. The loss snapped an eight-game winning streak for the Rebels, dating back to late in the 2008 season, and sent them tumbling to #21 in the AP Poll. Ole Miss would rise no further than 20th in the poll for the remainder of the 2009 campaign. The Rebels bounced back to beat Vanderbilt on the road, but then fell to #3 Alabama at home the next week. Ole Miss recovered to win consecutive home games against UAB and Arkansas in impressive fashion before losing at Auburn in another uneven performance, establishing what would become a signature pattern for the Rebels in 2009: strong play at home but weak efforts on the road. Following the Auburn loss, the Rebels won three straight home games, including quality wins over Tennessee and LSU. Entering the final week of the season, the team was back in the rankings (no. 20) and seemed set for another winning record in the SEC and a trip to the Capital One Bowl, the SEC's highest-paying bowl destination outside of the BCS. Those plans were dashed, however, when the Rebels lost to Mississippi State in Starkville, 41–27, finishing the regular season at 8–4 overall and 4–4 in conference play. One week later Ole Miss accepted an invitation to play in the AT&T Cotton Bowl Classic, marking the team's second consecutive trip to Dallas and the program's first back-to-back January bowl berths in 40 years. Ole Miss defeated Oklahoma State 21–7. Following two consecutive Cotton Bowl victories, the 2010 Ole Miss team didn't enter the season with expectations as high as last season. The Rebels started the season with a shocking loss to Jacksonville State in double overtime, but rebounded by defeating Tulane on the road by two touchdowns. The Rebels would fall to Vanderbilt in their SEC opener, 28–14 before winning the next two games against Fresno State and Kentucky, scoring 40+ points in both. After starting 3–2, Ole Miss would lose their next three games, including road losses against #8 Alabama by a score of 23–10, #21 Arkansas by a score of 38–24 and at home against eventual national champion #3 Auburn by a score of 51–31. The Rebels would improve their record to 4–5 after beating Louisiana-Lafayette at home by a score of 43–21, but would lose the rest of their games, including a blow out road loss against Tennessee with a score of 52–14, a thriller on the road against #5 LSU and a home loss in the Egg Bowl against #25 Mississippi State, 31–23. The Rebels would finish the season with a record of 4–8 and only one SEC win. The 2011 Ole Miss football team was the worst since 2007, despite managing a top 20 recruiting class. The Rebels opened the season at home against BYU, who they lost to in a very close game, 14–13. Ole Miss rebounded by beating the FCS's Southern Illinois at home, by a score of 42–24. Ole Miss would get blown out in its SEC opener against Vanderbilt on the road, losing by a score of 30–7. Ole Miss returned home for its home SEC opener against Georgia where they lost 27–13. Ole Miss bounced back from two straight losses with a double digit road win against Fresno State, but lost its next game to eventual national champion, #2 Alabama by a score of 52–7. The Rebels hosted #10 Arkansas in its next game, and, despite playing the Razorbacks relatively close, Ole Miss fell short by a score of 29–24. The Rebels would lose their next three games, including two double digit road losses against Auburn and Kentucky before returning home and getting blown out by Louisiana Tech, in a game where they lost by 20 points. Ole Miss then played host to eventual SEC champion, #1 LSU, where they lost 52–3. This game would come to be the biggest blowout in the history of the Magnolia Bowl. Ole Miss finished the regular season by getting blown out on the road against rival Mississippi State by a final score of 31–3. Ole Miss finished the season with a record of 2–10 and 0–8 in SEC play. Following the firing of coach Houston Nutt, Ole Miss hired new head coach Hugh Freeze from Arkansas State University. With Freeze at the helm, Ole Miss opened the season with wins against the University of Central Arkansas and UTEP before getting beaten soundly at home by the University of Texas by a score of 66 to 31. The following week Ole Miss traveled to New Orleans and defeated Tulane. Ole Miss then lost two competitive games at #1-ranked Alabama and Texas A&M before reeling off two wins against Auburn and at Arkansas. Ole Miss then lost an away game to #7-ranked Georgia and a heartbreaker to Vanderbilt at home and another at #8 LSU. Now at 5 wins and 6 losses, Ole Miss defeated Mississippi State at home by a score of 41–24 to earn a bowl-game berth for the first time since 2009. Ole Miss defeated the University of Pittsburgh 38–17 in the BBVA Compass Bowl to finish the 2012 season with a record of 7–6. Ole Miss also managed to reel in a stellar recruiting class, ranked as #10 by Rivals and headlined by Robert Nkemdiche. Ole Miss opened the 2013 season with one of the best recruiting classes in the country, ranking at number four according to 247sports. Ole Miss's 2013 class was headlined by the number one and number three overall recruits, Robert Nkemdiche and Laremy Tunsil. Hugh Freeze and the Rebels opened the 2013 season with three straight wins over Vanderbilt, Southeast Missouri State and Texas. With a 3–0 record, Ole Miss had a #21 ranking which was the first time that the Rebels were nationally ranked since 2009. Despite starting 3–0, Ole Miss lost the next three games, including a shutout loss against top-ranked Alabama, eventual SEC Champion Auburn and a heartbreaker at home to #9 Texas A&M. The Rebels' three game losing streak was snapped after holding off #6 LSU at home, and they went on to win the next three games (all by double digits) and returned to the top 25 with a #24 ranking entering a matchup against #8 Missouri, who they lost to by a score of 24–10. Ole Miss lost the final game of the regular season against Mississippi State in overtime, and finished the regular season with a 7–5 record. The Rebels were invited to play in the Music City Bowl against Georgia Tech, who they beat 25–17. After winning consecutive bowl games, expectations rose for Ole Miss entering the 2014 season. Hugh Freeze pulled off the number 14 recruiting class, which was still impressive despite having the number four recruiting class a year ago. Ole Miss entered the 2014 season with a No. 18 ranking, which was the first time Ole Miss started the season as a ranked team since 2009. After beating Boise State on a neutral field by 22 points and blowing out rival Vanderbilt and Louisiana-Lafayette, the Rebels rose to No. 10 in the AP Poll. After a close call against Memphis, Ole Miss fell one slot in the rankings to No. 11. Ole Miss then hosted #3 Alabama, which was the first time the Rebels ever hosted College Gameday. Ole Miss pulled a major upset by beating the Crimson Tide by a score of 23–17, which was only the tenth time Ole Miss had ever beaten Alabama and the first time they beat them in ten years. Following the upset, Ole Miss rose to No. 3 in the AP Poll and traveled to No. 14 Texas A&M, which, with a crowd of 110,633, was the largest crowd Ole Miss has ever played in front of. The Rebels beat the Aggies by a score of 35–20, and led by as many as 28 points. This also marked the first time that Ole Miss has ever beaten back to back ranked opponents. After beating Tennessee soundly at home, the Rebels had a 7–0 record for the first time since 1962. However, Ole Miss's undefeated season would come to an end after losing on the road to No. 24 LSU by a score of 10–7. Despite coming off of a loss, Ole Miss still ranked in the top four of the first ever College Football Playoff rankings, and played host to the third-ranked Auburn Tigers, where they lost, 35–31. Following a 48–0 blowout of Presbyterian, Ole Miss was shut out on the road against Arkansas, where they lost, 30–0. The Rebels fell to No. 18 in the AP Poll entering their final regular-season matchup against No. 4 Mississippi State, whom they beat by a score of 31–17. Having beat then–no. 3 Alabama and now No. 4 Mississippi State, this was the first time since 1969 that the Rebels had beaten two teams ranked in the top 5 in the same season. Ole Miss finished the regular season with a No. 9 ranking and they were invited to play in the Peach Bowl against No. 6 TCU, which was one of the New Year's Six bowl games. However, TCU beat the Rebels easily by a score of 42–3, and Ole Miss finished the season with a No. 17 ranking. The Rebels headed into the 2015 season with yet another top-20 recruiting class, ranking at #15 according to 247 sports. The Rebels started the season ranked #17 in the AP Poll, and for the second straight season, played every game as a ranked team. The Rebels opened the season against FCS foe Tennessee–Martin, who they beat behind strong quarterback play by JUCO transfer Chad Kelly, who led his Rebels offense to a 76–3 victory, which was the most points scored by any Ole Miss team since 1935. They followed with 73–21 rout of Fresno State, once again led by strong offensive production by Kelly. Ole Miss's third game was against the second-ranked Alabama Crimson Tide, while Ole Miss entered the game ranked #15. Despite being nearly double digit underdogs, the Rebels led by as many as 20 points and as many as 19 in the fourth quarter. Despite Alabama's furious comeback, Ole Miss held on to get their first ever win against an AP top 2 team beating the Tide 43–37. This was also the first time Ole Miss had ever beaten Alabama in back to back seasons and only their second–ever win on the road against Alabama (the first one came in 1988 under Billy Brewer). The Rebels jumped to #3 in the AP Poll the following week, which was the first time Ole Miss was ranked in the top 3 in consecutive seasons since 1963–64. In the next game against rival Vanderbilt, Ole Miss was 25 point favorites, but struggled mightily against a much–improved Vanderbilt defense. The Rebels limped to a 27–16 win, their first home win against the Commodores since 2006. The next week, Ole Miss maintained its #3 ranking and traveled to the #25 Florida Gators, where they were 7 point favorites. The Rebels were blown out, however, losing 38–10 and falling to #14 in the AP Poll. Ole Miss rebounded with an easy win over New Mexico State then surprisingly lost to an unranked Memphis team on the road, entering the game at #13. Ole Miss fell to #24 then easily cruised to a 23–3 victory over #15 Texas A&M and moved up to #19 in the AP Poll. Ole Miss then beat Auburn on the road, by a score of 27–19 which marked the first time that Ole Miss has ever beaten Alabama and Auburn on the road in the same season. The Rebels were then ranked #18 entering a matchup against an unranked Arkansas team and controlled their own destiny in the SEC West. Arkansas, however, pulled the upset on a miracle 4th & 25 conversion in overtime after Ole Miss scored the first touchdown in the overtime period. Ole Miss then finally got a week off, and played their next game ranked #22 in the College Football Playoff rankings heading into a game against a rival, #15 LSU. The Rebels trounced the Tigers, 38–17 and led by as many as 24 points. This was the first time ever that the Rebels had beaten Alabama, Auburn and LSU in the same year. Ole Miss moved up to #18 in the rankings heading into the Egg Bowl, where they faced #21 Mississippi State, who they hadn't beaten on the road since 2003. The Rebels won in Starkville 38–27, secured their third win over the Bulldogs in four years and marked the first time since 2008 that they had beaten Mississippi State and LSU in the same season. Ole Miss then earned their first Sugar Bowl birth since 1970, where they dominated #12 Oklahoma State, 48–20. This was arguably Ole Miss's best season since the Vaught era, their first ten win season since 2003, and the Rebels finished at #10 in the final AP Poll. 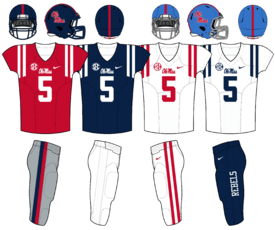 The Ole Miss Rebels currently have four combinations of uniforms that they are known to sport. All combinations involve gray pants with stripes of red and blue. The Rebels use blue jerseys for their primary home uniforms and red jerseys as alternates; both have bold white numbers and white shoulder stripes. White jerseys with red numbers and stripes are used on the road. On October 30, 2010, the Rebels wore all-gray uniforms for the first time in their annual bout with the #1 Auburn Tigers. The gray jerseys are adorned with blue and red shoulder stripes and blue numbers outlined in red. Although worn at home, Mississippi's all-gray uniforms are considered white jerseys (rather than colored); consequently, visiting opponents will wear their home, colored jerseys while the Rebels wear all-gray. The Rebels broke out the all-gray combination again for their 2012 game at Alabama. Announced on April 13, 2013 were new uniforms sporting blue pants with "REBELS" in white print on the sidings to go along with white a silver pants. White away jerseys were also added with the stripes and numbers colored in blue rather than the usual red. One notable combination is blue on blue. Ole Miss occasionally wears powder blue helmets. At home they wear them with red tops and away with a white jersey with red accents and gray pants. The Battle for the Golden Egg (nicknamed the Egg Bowl) is the Rebels biggest game of the year against in-state SEC rival Mississippi State University (MSU) Bulldogs. While the 2 teams have played each other since 1901, with 2003 being the year in which the 2 teams had played each other 100 times and now having played each other a total of 113 times, the first game officially known as "The Battle of the Golden Egg" was in 1927. While it is called a "Bowl", the game is not a postseason bowl game, but rather a regular season Southeastern Conference (SEC) game. Ole Miss leads the series with 63 wins to MSU's 44 wins. There have been 6 ties. The Egg Bowl has not been as much in the spotlight as other college football rivalries, but as of late, the game has gained more national attention. In 2014, the game gained much more national attention due to the postseason implications the game possessed. Mississippi State entered the game with a #4 ranking in College Football Playoff, and had a spot in the Playoff on the line entering the game against Ole Miss, who was ranked #19. This marked only the fifth time in the rivalry's history that both teams entered the game ranked. MSU also had a chance at making the SEC title game, where they needed a win and an Alabama loss. In an upset, Ole Miss beat the Bulldogs 31–17 and took back the Golden Egg and jumped from #19 to #9 in the College Football Playoff rankings. Both schools got New Year's Six bowl games. Going into the 2016 Egg Bowl, both teams had gone through disappointing seasons. MSU had already clinched bowl ineligibility at 4-7 and Ole Miss was 5-6, and needed to win the game in order to become bowl eligible. Ole Miss was an eight point favorite over the Bulldogs and had won the last two meetings, but Mississippi State thoroughly routed Ole Miss 55-20 in Oxford, marking the first time the Rebels had lost at home to the Bulldogs since 2010. The loss resulted in a 5-7 season for the Rebels, and was the first time in Hugh Freeze's tenure at Ole Miss that they would fail to clinch a bowl berth. Neither team has experienced much recent success on the road in this rivalry, as Ole Miss has won six of their last eight home games against MSU and the Bulldogs have won five of their last six home games against Ole Miss. The 100th meeting of the series in 2011 was forgettable for the Rebels in every regard. LSU humiliated the Rebels 52–3 at Oxford, and could have made the score even more lopsided if not for Tigers coach Les Miles ordering third string quarterback Zach Mettenberger to take a knee four times after LSU gained a first-and-goal at the Ole Miss 1-yard line with five minutes to play. 2012 issued another Bayou Classic with LSU winning 41–35 via a 1 yd TD plunge by Jeremy Hill with less than one minute to go in the contest. The 2001 Ole Miss-Arkansas game set a NCAA record for most overtime periods played (7). It has since been tied, but never broken. Arkansas won that game 58–56 off a 2-point Rebel conversion that got stopped just short of the goal-line. The very next year, Ole Miss played Alabama as nearly double digit underdogs, having won only one road game against Alabama in the history of their program, in 1988. Ole Miss once again managed to upset the second–ranked Crimson Tide, 43–37, thanks in part to an explosive Rebel offense led by quarterback Chad Kelly in a game where the Rebels never trailed and led by as many as twenty points and as many as nineteen in the fourth quarter. This marked the first time Ole Miss had ever beaten Alabama in back to back seasons, and, following this massive upset aided by two incredible fluke plays (and one questionable play) for touchdowns and five Alabama turnovers, Ole Miss once again jumped to #3 in the AP Poll, marking the first time since 1963–64 that Ole Miss had been ranked in the top three in consecutive seasons. Vanderbilt and Ole Miss have played annually since 1942. When the SEC split into divisions in 1992, the Commodores and Rebels were selected as permanent cross-division rivals. Though Vanderbilt won the first 18 games in the rivalry, Ole Miss leads the all-time series 50–38–2. As of late, this rivalry hasn't gotten as much attention as other rivalries in the SEC, especially since the Rebels have currently won three straight and have won 16 of the last 23, nine of which were won by double digits. The Ole Miss–Memphis football rivalry has also been a far less competitive rivalry series. The Rebels hold a 48–11–2 advantage over the Tigers in the series. The two schools have met 60 times from 1921–2014. This rivalry has was temporarily terminated from 2010–2013, with Ole Miss winning every game from 2005–09. The rivalry was resumed in 2014 when Ole Miss entered ranked #10 in the AP Poll and Memphis was unranked and heavy underdogs. The Rebels played host to the Tigers, and although Memphis played Ole Miss competitively through the first three quarters, the Rebels ultimately pulled away in the fourth quarter after only holding a 7–3 after the end of the third. Ole Miss won the game 24–3 to increase their winning streak against Memphis to six straight. The 2015 game of this rivalry was of particular importance, especially to Memphis. This was one of the most anticipated games in the history of Memphis football as they hosted then–no.13 Ole Miss. It appeared as if the Rebels were going to blowout the Tigers after taking a 14–0 lead in the first quarter, but Memphis answered with 24 straight points before halftime. The Tigers extended their lead to 31–14 after scoring on the first possession of the third quarter, and held onto their lead for the rest of the game, upsetting Ole Miss, 37–24. The Rebels fell eleven spots in the AP Poll to #24 and Memphis entered the rankings at #18. It was the Tigers' first victory over a ranked team since defeating No. 6 Tennessee in 1996. Ole Miss has eleven former players and coaches in the College Football Hall of Fame. Ole Miss has two former players in the Pro Football Hall of Fame. Ole Miss has three former players in the Helms Athletic Foundation Hall of Fame. **2009 marks the first time in school history Ole Miss has had two players taken in the first round of the same NFL draft. The school's fight song is Forward Rebels, also known as Rebel March. A modification of the Elvis Presley song An American Trilogy, now known as From Dixie with Love or Slow Dixie, was also played during football games, both home and away. The first time the song was played was during the half-time show performance by the "Pride of the South" band at LSU in 1984. It was played at every game continually until 2009. The traditional song "Dixie" is another school song. As of 2016, however, "Dixie" is no longer played at Ole Miss sporting events. Another unofficial song is I Saw the Light. Since 1983, the administration has distanced itself from Confederate symbols, including barring faculty from displaying any Confederate imagery in their offices. In 1997, the university student senate passed a resolution requesting fans not to display the Confederate battle flag at university athletic events. Using this action as encouragement, the university then banned sticks under the guise of fan safety, to discourage fans from displaying the Confederate flag at football games and other athletic events. This controversy began when head coach Tommy Tuberville complained that the battle flag had hampered his attempts to recruit a few top-notch black athletes. Coaches prior to Tuberville also expressed concerns about the difficulty of recruiting top-notch black athletes. In 2003, the school's mascot, Colonel Reb, was discontinued from official participation in athletic events by the school. The school solicited ideas to replace Colonel Reb, but after an exceedingly lackluster response, decided to go without a mascot. An unofficial Colonel Reb mascot still makes appearances in The Grove, Ole Miss' tailgating area, before home games. In 2010, the university began its plan to phase out the use of Colonel Reb on official merchandise such as hats and shirts. The university has reclassified the Colonel Reb trademark as a historical mark of the university. On October 14, 2010, it was announced that students, alumni and season ticket holders at the university had picked Rebel Black Bear as their new mascot. The announcement was the result of a campuswide vote in February and months of polling. The bear beat out two other finalists, the Rebel Land Shark and something called the "Hotty Toddy," an attempt to personify the school cheer. While most people confuse the school mascot by calling it the "Black Bear" Ole Miss has not adopted that term as an official branding of the mascot. The current Ole Miss mascot is simply the Rebel Bear. Roy Lee "Chucky" Mullins was a 20-year-old football player at Ole Miss that was injured playing football in 1989 and became a well-known quadriplegic. Mullins, born on July 8, 1969 in Russellville, Alabama, was injured on October 28, 1989, during the Ole Miss Rebels' Homecoming game against the Vanderbilt Commodores in Oxford. As Mullins plunged head-first into a tackle of Vandy fullback Brad Gaines after a short pass reception, the impact shattered four vertebrae in his cervical spine, immediately paralyzing him. As soon as the injury occurred, Mullins became the recipient of a huge outpouring of community support. Ole Miss fans, college football fans in the South, and people from all over the nation immediately began to donate money towards Mullin's growing medical expenses. President George H.W. Bush visited Mullins in his hospital room and encouraged him while on a visit to Memphis. Soon, Ole Miss established the "Chucky Mullins Trust Fund" to properly manage the donations. The city of Oxford donated land for a specially-designed handicap accessible house for Mullins. Donations to the trust fund eventually exceeded $1 million. 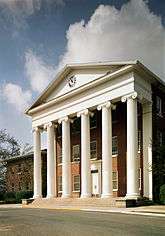 Mullins returned to Ole Miss on June 20, 1990 to complete his undergraduate studies. Less than a year after returning to school, Mullins was stricken by a pulmonary embolism, caused by blood clots formed by inactivity and poor circulation. He died in the hospital on May 6, 1991 and was buried outside of Russellville. During Mullins' time in the hospital, he and Gaines, who did not know each other before the accident, became close friends. Every year since Mullins' death, Gaines, alone, visits and maintains his friend's gravesite three times a year: May 6 (the anniversary of Mullins' death), October 28 (the anniversary of the injury), and December 25 (Christmas Day). *The Rebels will face off against the Texas Tech Red Raiders in 2018 and the Baylor Bears on September 5, 2020 in the AdvoCare Texas Kickoff at NRG Stadium in Houston. ↑ "Licensing FAQ's". Department of Licensing – University of Mississippi. Retrieved 2016-07-11. ↑ DeLassus, David. "Dr. N.P. Stauffer Records by Year". College Football Data Warehouse. Retrieved February 19, 2012. ↑ "Hazel Signs as Coach". Altoona Tribune. February 7, 1925. p. 8. ↑ "Mississippi Yearly Results (1925-1929)". College Football Data Warehouse. David DeLassus. Retrieved November 12, 2015. ↑ "Homer Hazel Gives Up Ole Miss Post". The Anniston Star. January 17, 1930. p. 14. ↑ "Vann expresses sorrow: Former Ole Miss coach, Homer Hazel, dead at 72". Hattiesburg American. February 5, 1968. ↑ "USATODAY.com - Orgeron introduced as football coach at Ole Miss". Retrieved 30 April 2016. ↑ "Nutt agrees with Ole Miss hours after resigning from Arkansas". ESPN.com. Retrieved 30 April 2016. ↑ SEC teams adjust to 'Houston Nutt rule' | AL.com. Blog.al.com. Retrieved on July 19, 2015. ↑ "FBS College Football History". NCAA.com. Retrieved 2015-12-09. ↑ "Billingsley's National Champions". Archived from the original on September 28, 2011. ↑ "AP and Coaches Yearly Final Polls". Retrieved 30 April 2016. ↑ "OLE MISS Official Athletic Site – University of Mississippi". Olemisssports.Com. Retrieved 2013-06-17. ↑ "Sporting News - NFL - NCAA - NBA - MLB - NASCAR - UFC - WWE". Sporting News. Retrieved 30 April 2016. ↑ "Anderson: Saban's Tide dance just another little lie – Pittsburgh Post-Gazette". Post-gazette.com. 2007-01-04. Retrieved 2013-06-17. ↑ "Houston Nutt of Mississippi Rebels to resign at end of season – ESPN". Espn.go.com. 2011-11-08. Retrieved 2013-06-17. ↑ "2013 Football Team Rankings". 247sports.com. Retrieved 2015-12-09. ↑ The Daily Reveille: LSU, Ole Miss to student body: "Name that Rivalry"
↑ "Ole Miss, Memphis Renewing Rivalry in Football, Men's Hoops – Ole Miss Rebels Official Athletic Site Ole Miss Rebels Official Athletic Site – Men's Basketball". Olemisssports.com. Retrieved 2015-12-09. ↑ Vaught, John (1971). Rebel Coach, My Football Family. Memphis, Tenn: Memphis State University Press. p. 59. ISBN 0-87870-008-0. ↑ "Rebel Black Bear voted new Mississippi mascot". ESPN.com. Retrieved 30 April 2016. ↑ "- Ole Miss Rebels Official Athletic Site Ole Miss Rebels Official Athletic Site - Football". Retrieved 30 April 2016. ↑ Kelley, Kevin (11 August 2016). "Ole Miss, Texas Tech agree to 2018 game in Houston". FBSchedules.com. Retrieved 17 August 2016. ↑ McMurphy, Brett (17 February 2016). "Sources: Baylor, Ole Miss agree to start 2020 season in Houston". ESPN. Retrieved 17 August 2016.